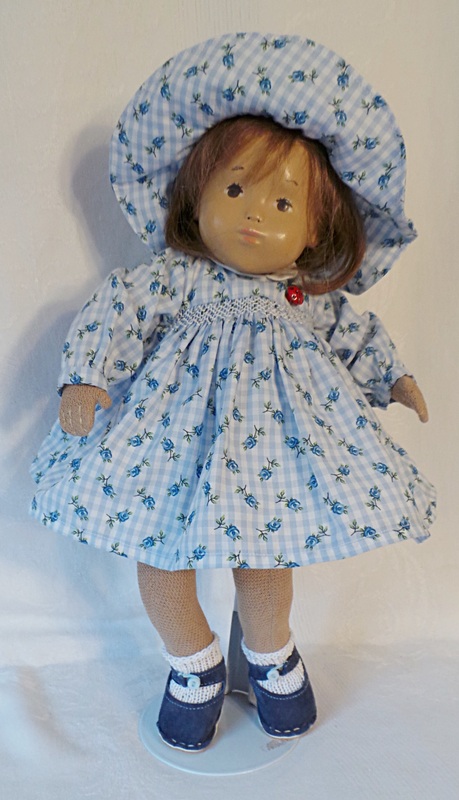 Gracie is wearing a beautiful, new dress and shoes, socks, and hat made by Thu Cuc Faes who lives in Switzerland. Mummy shared that Ellie was made in 2001 in Germany at the Gotz doll factory just like me! She came to Sasha Shangri-La in her original outfit and tube which are safely stored. 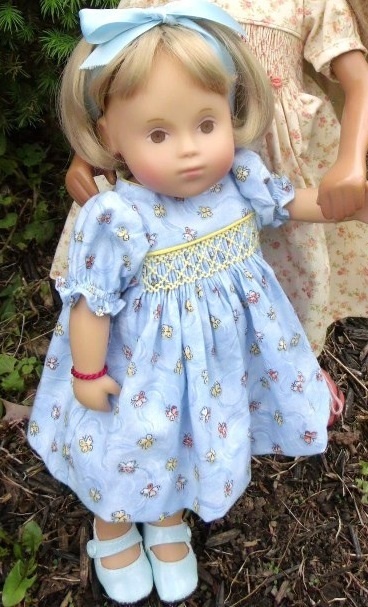 Ellie has been redressed by Mummy in an pretty outfit found on Shelly’s site. Her leather shoes were made by Jean Jensen. You might be able to see the faint JJ marks on the soles of her shoes. A pretty gingham ribbon seems to work well with Ellie’s head of beautiful curls. Ellie toddling and on the move. Ellie and I want Gracie to stand up but…. Gracie says let’s sit down to wave goodbye to everyone that has visited us. 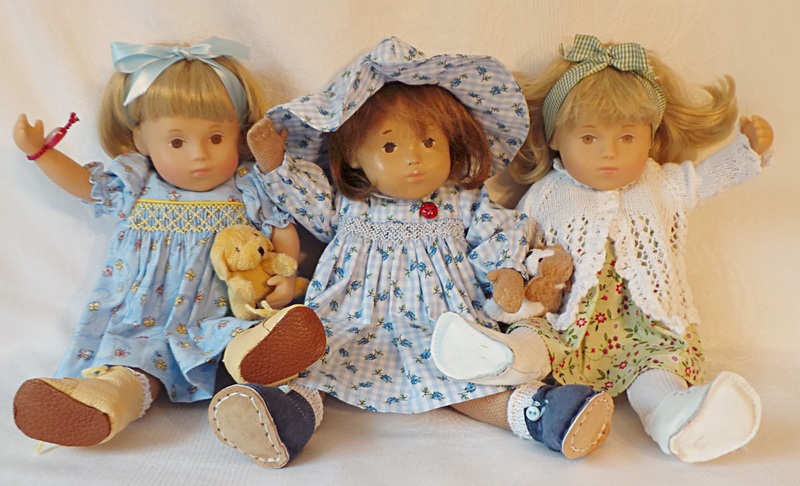 Hi Ginger Thanks for sharing your lovely toddler photos…beautiful clothes and such pretty girls. Great to see and compare two Iona toddlers together. You can immediately see quite a few differences relating to their eye paintings and hair styles. 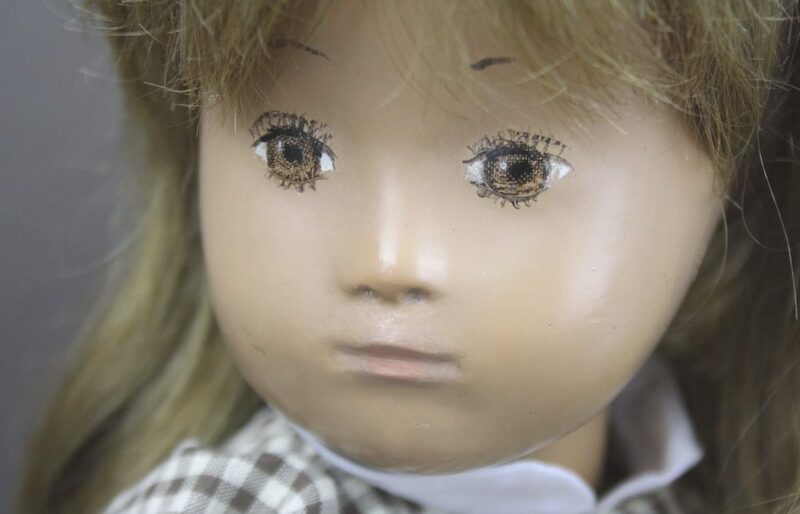 I know that these pale skinned Iona dolls were only made for the one year but I was wondering if you have any idea of the manufactured timing (early,middle or later) within that year? Now I know that they weren’t limited editions as such but these later 2001 Gotz dolls they did come with a card tag that did have some identification numbers written in it and so I’m wondering if these are of any help here? Thank you to Gracie, Betsy and Ellie for your good wishes to my Studio Bebe and toddler Bea,for their coming week as they are both getting very excited about going to the CnS..
Hi Kendal and I wonder too about the toddlers and their dfferences. I would like to look further into the time frames in 2001 when they were made and why they look noticably different. I will share what I learn here on the blog. You’ll find that Betsy is the older of the two Ionas with her darker eyes and rosier cheeks plus her shorter, straighter hair style although Ellie is perhaps the prettier.. 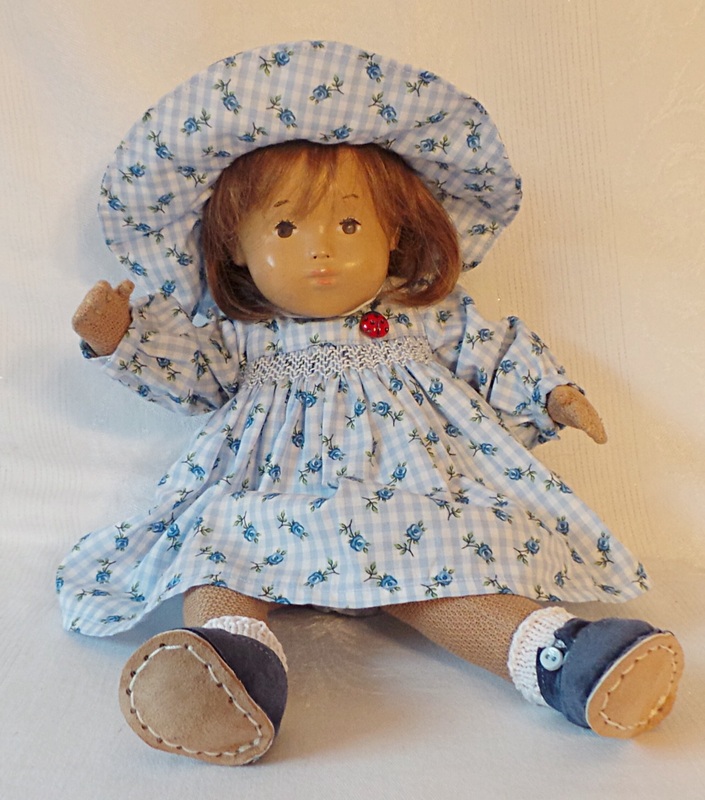 When I first spotted Gracie on Shelly’s she was already sale pending as such so I put my name down for a ‘second’ first refusal just in case the buyer backed out (which she did)…. 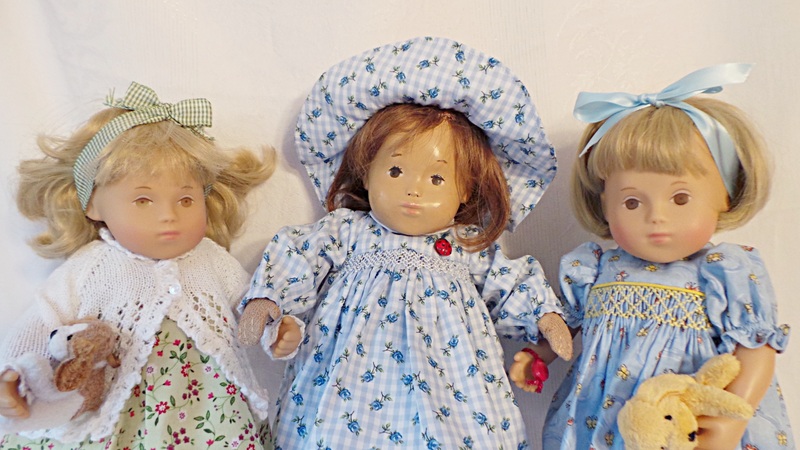 so then I had to make a huge decision as although Gracie is definitely prettier than mine, both facially and hair-wise,,my little tot is slightly ‘mintier’ and has her complete original and labelled red/white checked gingham dress outfit and original ribbon in her hair…. 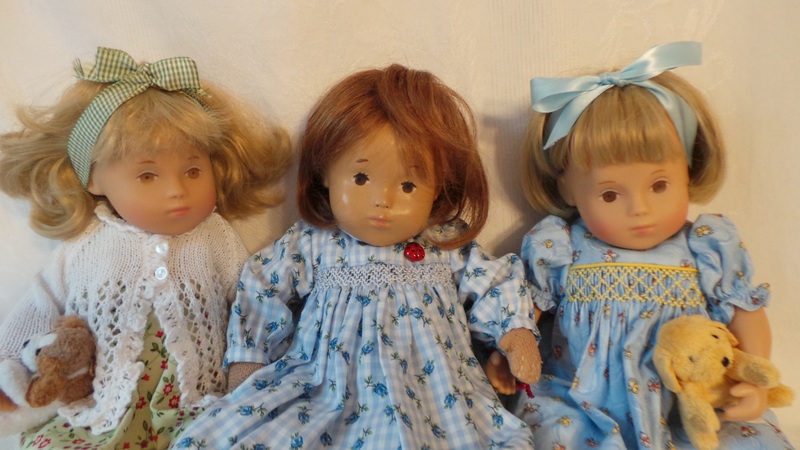 so I sadly passed on Gracie’s sale as I couldn’t afford to have and keep them both…. SO it is indeed really lovely for me to keep in close contact with her here on your blogspot.. Please give her a hug and kiss from me. Thank you Kendal for the age information about Betsy and Ellie. It is good to know this and I think Ellie looks younger in the face. Congratulations on your new toddler who is ever so sweet with her curls. How lovely they all are together, but lovely to see the two ‘what used to be called Iona toddlers’ together to see the huge contrast in not only hair styles but also eye painting. Beautiful outfits as always, I can see these three are going to get on beautifully. I don’t blame you for keeping both, they are so different indeed, but definitely sisters. Ginger, they are so sweet, I wish I had a toddler. It’s surprising how different their eyes are being the same Iona originally. I love there dresses and they are perfect little companions for Gracie. What a beautiful new addition to your Sasha family Ginger, I really like the new little toddler, and yes, they’re twins but ‘different’ to one another, which is great! I love her curls, such a contrast to little Betsy! Such cute little girls! Thanks again for sharing your lovely girls with us! What lovely well behaved girls you have, they are so sweet together. I love the hair ribbons on your toddlers – they frame their faces perfectly. Does Gracie ever wear one? Hi Rosie! Thank you for the lovely comments about the girls. I, too, like their hair ribbons and I am trying to spend more time thinking about the hair styles and the prettiest ribbons for their outfits. The photo’s at the end of the three of them are so endearing. Ellie looks lovely and I love her hair, the same but not as her new sister Betsy. The new girl Ellie is so different to Betsy and yet they are the same, amazing.